Lois Hartman, ‘a distant relative of Charlotte I’ans Hawker’ is American and lives in Pasadena, California. Her publisher, Minerva Press, was a vanity publishing company which folded after being investigated by the BBC and the Mirror newspaper. This didn’t sound very encouraging, but I decided to press ahead with reading the book and to write up a synopsis as I went along. Each of the forty-two chapters is introduced by a quotation from the works of Robert Stephen Hawker. Assembling the quotes obviously required some patient research, and, as a person whose only attempt at a novel expired at around 5000 words and whose poems are generally completed in less than twenty-eight lines, I’m always impressed by the sheer hard labour that’s involved in delivering a full-length piece of writing. The book opens with Thomas I’ans and his brand-new bride, Margaret, arriving at Whitstone House in the autumn of 1719. Some choughs on a wall prompt a conversation about ancient shadows and portents of deaths in the family, and the Domesday book is mentioned, along with names of previous owners – Cobhams, Goulds and Badcocks. Events progress surprisingly quickly: bodice-loosening to firstborn is accomplished in the space of four pages. I couldn’t help feeling a bit cheated at having the candlelit disrobing in the rose-brocade bedroom dealt with so briskly, but there’s no time to linger – a hundred years need to be covered before Hawker can make an appearance. Edward, the firstborn, is joined by a younger brother, Richard, and the household expands to include Annie who looks after the nursery and speaks with an impenetrable Cornish accent. Fortunately the story is still moving at a cracking pace, and the boys grow up fast. Richard is clearly going to be trouble but Edward is a more conventional sort, and having shone at Oxford he announces that he plans to marry the daughter of a Baronet. Florence Wrey from Tawstock Court is his bride but there’s no time for character development – I feel as if I’m watching a speeded-up video. Florence and Edward I’ans have three children but only the eldest, Wrey, survives into adulthood. Wrey marries Fanny Rawleigh and seven children are born – four girls and three boys. The boys all seem to have died before their parents – Wrey marries, procreates and is buried in the space of less than two pages so I’ve no idea what happened to them. The girls, in order of age, are Florence (good with money), Charlotte (good at German), Catherine and Frances. Florence organises things, Charlotte is blonde and blue-eyed and has great strength of character and Catherine and Frances are twins and a bit wimpy. Time is beginning to slow to a more manageable pace, but with the four sisters all talking at once and much of the dialogue unattributable to any particular person there’s not a lot of gain in clarity for the reader. 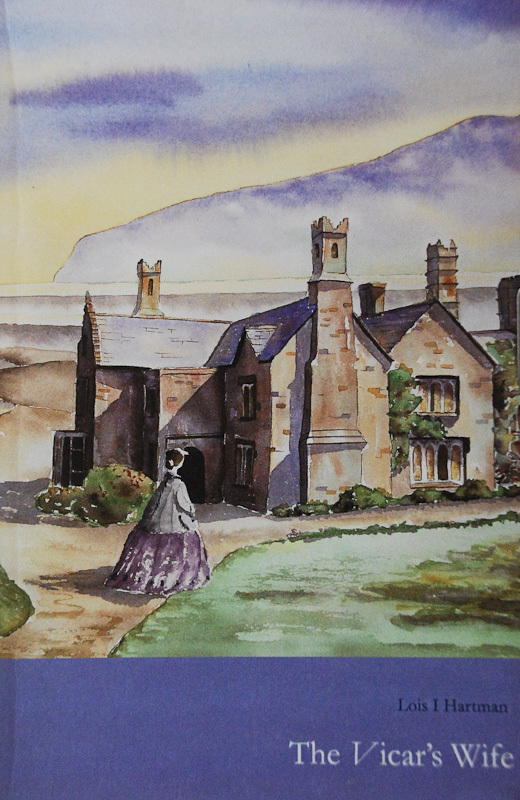 The women are living at Ebbingford House, having closed up gloomy Whitstone of the sad memories, when an urgent pounding on the door one evening heralds the arrival of an unexpected caller and ‘as unpredictable as the sudden storm that announced him’, Robert Hawker blows into the story. It’s page 57 and I’ve already forgotten the claim about it being a factual account – it’s so obviously a novel. Lois Hartman clearly likes ‘Robert’ – her writing takes on a new liveliness from here onwards – and apart from having black hair he’s sort of recognisable. His courting of Charlotte involves a great many conversations where they both sound as if they’re reading from scripts, but it’s obviously well meant. Their developing relationship is interrupted for a while by a flashback to their first encounter (he’d been scrumping green apples from the orchard at Whitstone and was sick all over his clothes – is this an anecdote I’ve missed by not reading the Sabine Baring-Gould biography? ), and then there’s a disconcerting lurch in the timeline and we’re about to find out what happened to Charlotte’s three brothers. Edward, John and their father all go off to fight in an unspecified war and while Colonel Wrey returns safely the two brothers die on their way back to England. Thomas looks after the farm during all the fighting, then he studies for the Church and is offered the living at Bicton by Lord Rolle. Charlotte’s mother, Fanny, dies of grief, Thomas dies of smallpox, Wrey dies of old age, the choughs lurk menacingly, and there’s talk of a curse having been put on the family by an ancient crone who objected to some windows being removed while Whitstone church was undergoing restoration. Phew. The rest of Charlotte and Robert’s courting, plus wedding, honeymoon, Oxford, the Newdigate prize and the appointment to the curacy of North Tamerton progress more or less as expected. Charlotte has a miscarriage during their time in Oxford, which is sad, and would be sadder if the crone’s curse wasn’t invoked to explain things. Now that the genealogy is out of the way there’s a sense of an interesting novel trapped behind the stilted dialogue, and I’m distracted by alternately re-shaping the book in my head and imagining it as a film. Jane Campion would make a good director and it could open with the four sisters, in full mourning, shutting up Whitstone House while the rain beats down on Colonel Wrey I’ans grave. It’s difficult to think of an actor capable of playing Hawker, although, at the appropriate age, Michael Gambon could have been a possibility. The rest of the novel is both a puzzle and a disappointment – the quality of the writing is no worse and no better than what’s gone before but something sour creeps into the telling. In addition to several departures from the known facts – the couple spend five years struggling in a rented cottage while the vicarage is being built; a Turkish ship called the Karasu is shipwrecked with forty men on board, all drowned; Hawker is frequently to be found sprinkling a sinister ‘powder’ into cups of tea – there’s a lot of harping-on about how unhappy they both are and the burdens that Charlotte is obliged to bear. It’s almost as if the author, in the process of converting her research into a full-length story, has decided that she doesn’t like Hawker after all. No one has much fun – although since ‘Robert’ has an affair with one of the villagers, baptises his own illegitimate daughter and misbehaves outrageously with the family finances, I suppose it could be said that he gets a bit more entertainment out of life than Charlotte does – everyone’s health is poor, and the choughs keep dropping meaningful hints about how death lies in wait for them all. The sisters die in the following order: Frances (TB), Catherine (lost without her twin), Florence (generally worn out with age and worry) and finally, Charlotte. And yes, I did shed a tear, despite everything. Robert gets a final half page to make a start on the ‘Sangraal’ which, rather oddly, begins ‘He ceased; and all around was dreamy night…’ After that the book ends with a short Postscript summing up Hawker’s final years, in which Rosalind is referred to as ‘Rosaline’ and Pauline is described as a Catholic. It’s pity that Lois Hartman chose to publish with a vanity press – if she’d been able to rely on the encouragement and advice of an editor and had persevered with further drafts The Vicar’s Wife could have been a much better book. However, I’m glad I read it because it does seem to have a solid core of fact and I now know a lot more about Charlotte. The snippets of information I’ve been able to extract from Byles’s Life and Letters, together with some research on the web, confirm that she grew up in far more comfortable circumstances than Hawker did, and was talented, determined and witty. I’ll certainly try to find out more about her, and perhaps put together a brief biography for the website. ADDENDUM – 29 DECEMBER 2011: I’ve found two more books by Lois Hartman on AbeBooks – Remembered in this Land, and Footprints Beside Him: a poignant love story of the Cornish Coast. The brief listings for the latter don’t shed any light on the contents and I suspect it may be an earlier edition of The Vicar’s Wife. Remembered in this Land is described as an ‘informal history of the author’s I’ans/Ijams family and her research in both England and America; first immigrants settled in Frederick County, Maryland. Illustrated with family photographs, original source documents, family trees.’ This sounds extremely promising, and if I’d paid better attention I might have guessed that the ‘I’ in Lois I. Hartman stood for Ijams/I’ans. I’ve ordered both and will report my findings in due course. ADDENDUM – 26 MAY 2012: Footprints Beside Him: a poignant love story of the Cornish Coast is, as suspected, an earlier version of The Vicar’s Wife. Remembered in This Land turns out to be a useful source of information on the I’ans family in general but doesn’t provide much fresh material on Charlotte, who seems to have left behind very little in the way of letters or journals. A short biography of Charlotte, based on C. E. Byles edition of The Life & Letters of R. S. Hawker, with additional material from Hawker of Morwenstow: Portrait of a Victorian Eccentric by Piers Brendon, has now been added to the website – click here to read more . . .